I don't watch a whole lot of basketball, but I did see a game yesterday where the player's shoe tore wide open. 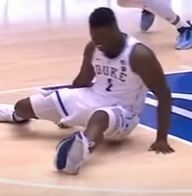 In sports, equipment failure is certainly part of the game, but in US college sports, which is typically well-funded (meaning they don't need to play using substandard equipment), I have never before seen a shoe failure such as this. Have there been other cases in college or professional basketball where shoes have failed in this manner? Not the answer you're looking for? Browse other questions tagged basketball equipment or ask your own question. How is it handled when two opposing players are gripping the basketball?